About NEC - National Electrostatics Corp.
National Electrostatics Corp. (NEC) is the world’s leader in the manufacture of electrostatic ion beam accelerator systems. A private, employee-owned company, NEC was incorporated in Middleton, Wisconsin in 1965. 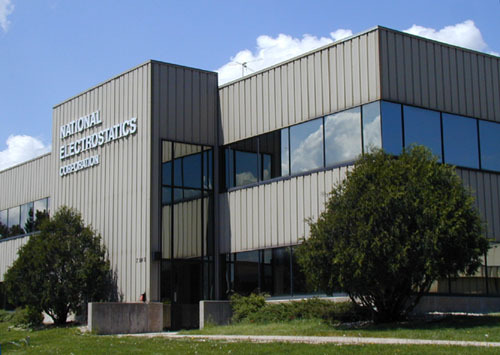 Located in Middleton approximately 20 minutes from Dane County Regional Airport in Madison, Wisconsin, our facility covers over 75,000 ft.2 and includes both manual and CNC machine shops, a complete metal/ceramic bonding facility, vacuum components and electrical components assembly areas, and space for extensive testing of Pelletron accelerator systems and materials analysis instruments. Our nearly 100 employees include electrical and mechanical engineers, ion beam system technicians, craftspeople, and other skilled workers. We pride ourselves on producing a wide variety of Pelletron accelerator systems to meet customers’ needs. To date we have manufactured over 230 Pelletron systems, with sales in over 50 countries around the world. These systems produce ion beams of essentially all stable nuclei with energies ranging from a few keV to hundreds of MeV. The Pelletron is the world’s only commercially available accelerator that incorporates an all metal and ceramic acceleration tube, with no organic material in the vacuum volume. The name “Pelletron” is derived from the metal pellet charging chain invented by Dr. Raymond Herb, which still functions as an essential component of Pelletron accelerator technology. Compared to earlier Van de Graaff charging belts, Pelletron charging chains are highly efficient, provide long life, require little maintenance, and provide extremely stable terminal voltage conditions. Pelletron systems range in size and configuration from the highly versatile 25 million volt tandem Pelletron at the Oak Ridge National Laboratory (the world’s highest voltage accelerator) to dedicated analytical instruments using MeV ion beam technology. MeV ion beam instruments are available for standard Rutherford backscattering (RBS) analysis, channeling RBS, particle induced X-ray emission (PIXE), micro PIXE and micro RBS, very high-sensitivity accelerator mass spectrometry (AMS), and a wide variety of other materials analysis techniques. A wide range of ion sources and beamline components have also been developed with our Pelletron accelerators over the last 50 years. These products have proven to be reliable with extensive use in accelerator systems worldwide.